On November 13, 2018, Vice President Wang Qishan met with Foreign Minister Heiko Maas of Germany at the Great Hall of the People. Wang Qishan expressed that the breadth and the depth of China-Germany cooperation have reached an unprecedented level since the establishment of bilateral diplomatic relations 46 years ago, with fruitful results yielded from practical cooperation in such fields as politics, economy, trade, and people-to-people and cultural engagement. President Xi Jinping paid his first state visit to Germany in 2014, during which China-Germany relations were upgraded to all-round strategic partnership, elevating bilateral cooperation to a new development phase. The current international situation is faced with many issues, and we can learn from China's development experience that only by continuous innovation, accelerated reform and further opening up can we promote development and achieve prosperity, and that adhering to peaceful development and jointly building a community with a shared future for mankind is the broad and bright path forward. The Chinese side is willing to work with the German side to increase understanding and mutual trust, and strengthen the integration of development strategies on the basis of mutual respect, so as to achieve a higher level of complementary advantages and win-win cooperation. 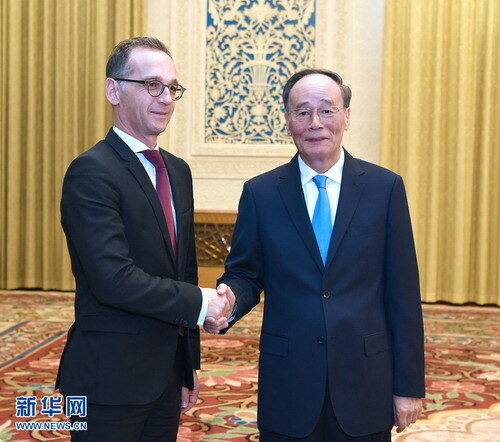 Heiko Maas expressed that Germany and China have enjoyed close high-level exchanges, and bilateral relations have been running at a high level in recent years. Heiko Maas hoped to deepen Germany-China cooperation to jointly cope with the current global challenges through this visit.